When most of us hear the word ‘defect’, we think of a problem that has to be solved. But a team of researchers at the University of South Florida (USF) created a new defect that just might be a solution to a growing challenge in the development of future electronic devices. 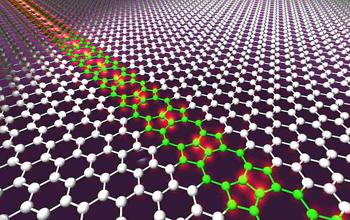 The team lead by USF Professors Matthias Batzill and Ivan Oleynik, whose discovery was published on March 30th in the journal Nature Nanotechnology, have developed a new method for adding an extended defect to graphene, a one-atom-thick planar sheet of carbon atoms that many believe could replace silicon as the material for building virtually all electronics. This tiny wire could have a big impact on the future of computer chips and the myriad of devices that use them. In the late 20th century, computer engineers described a phenomenon called Moore’s Law, which holds that the number of transistors that can be affordably built into a computer processor doubles roughly every two years. This law has proven correct, and society has been reaping the benefits as computers become faster, smaller, and cheaper. In recent years, however, some physicists and engineers have come to believe that without new breakthroughs in new materials, we may soon reach the end of Moore’s Law. As silicon-based transistors are brought down to their smallest possible scale, finding ways to pack more on a single processor becomes increasingly difficult. Metallic wires in graphene may help to sustain the rate of microprocessor technology predicted by Moore’s Law well into the future. The discovery by the USF team, with support from the National Science Foundation, may open the door to creation of the next generation of electronic devices using novel materials. Will this new discovery be available immediately in new nano-devices? Perhaps not right away, but it may provide a crucial step in the development of smaller, yet more powerful, electronic devices in the not-too-distant future.